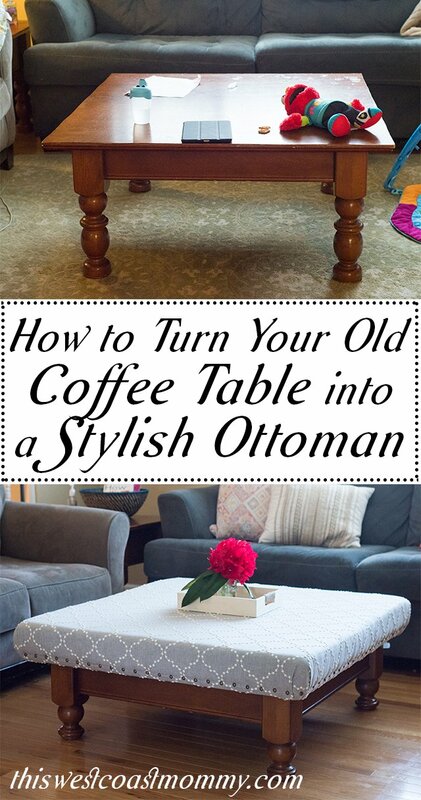 There are three big reasons I decided to convert my coffee table to an ottoman…and do the project myself. 1. 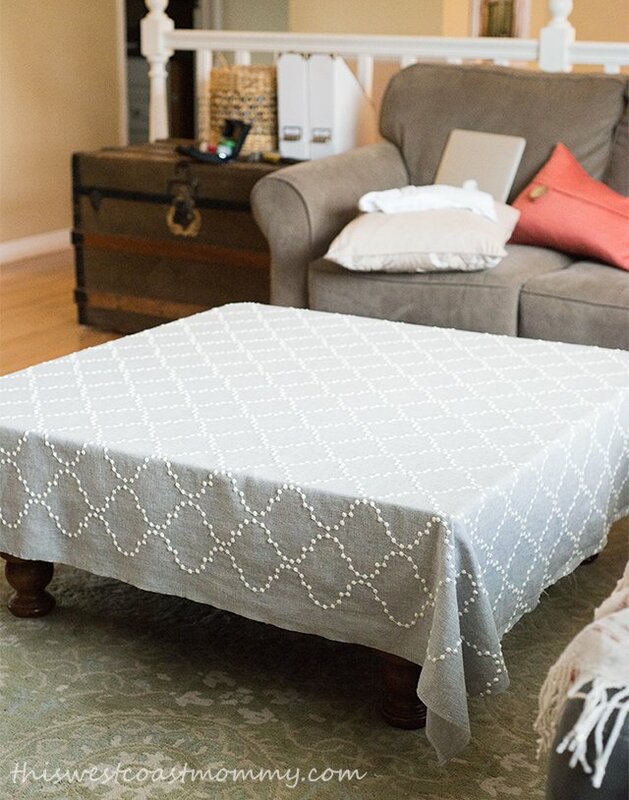 Adding touches of fabric warms up a room – think of curtains vs. bare windows or an area rug vs. empty floor – so repurposing a wood table into an ottoman just made everything look cozier without being overwhelming. 2. 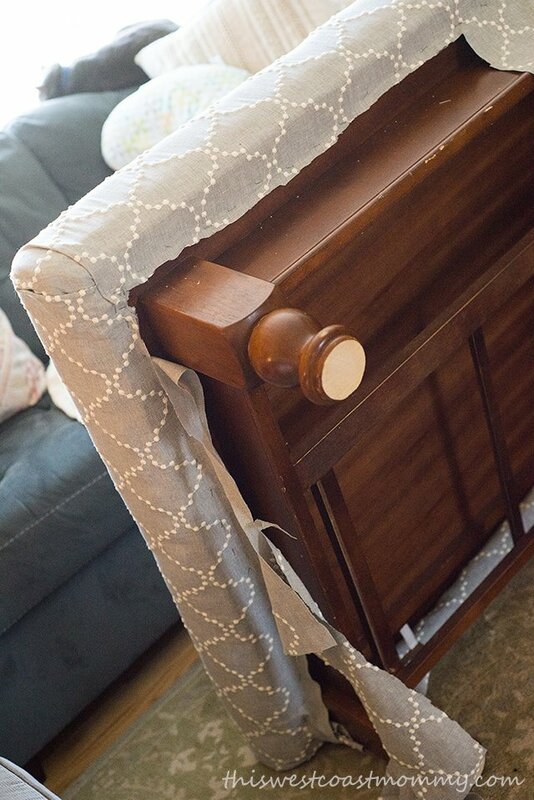 A simple upholstery project like this one is way easier than it looks. By doing it myself, I saved money and totally customized it to fit my style. 3. Like many parents of small children, I’ve been waging war against sharp corners. 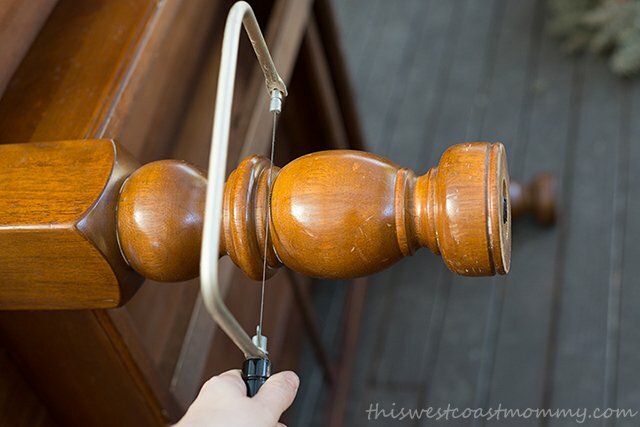 This was a practical way to eliminate some of the worst edges in our living space and prevent future head trauma. This coffee table conversion was something I’d been wanting to do for at least a year, but I was actually a bit intimidated by the process of making over a large piece of furniture. If I had known how foolproof this method is, I would have done it long ago. So here I am telling you – you can do it! 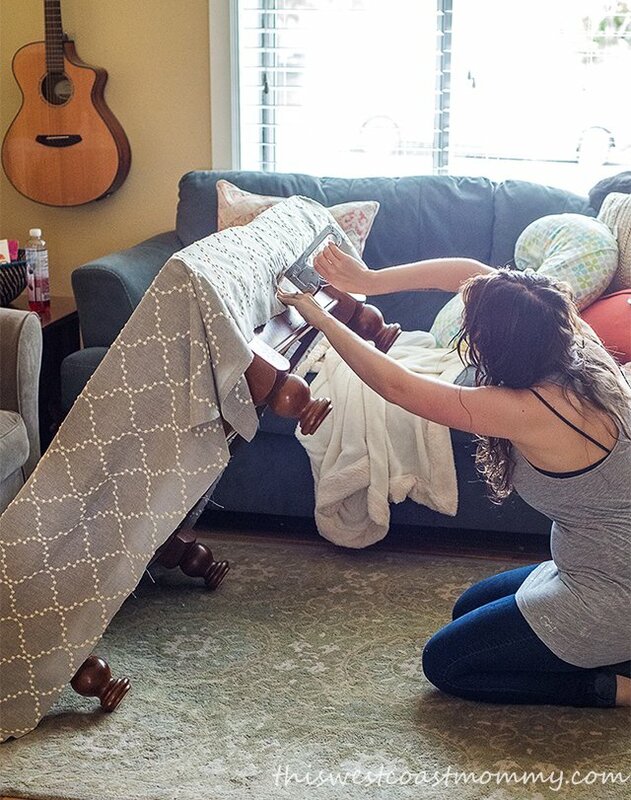 Now, I know there are fancier ways of going about this, by adding tufting and such, but I’ve really got my hands full with a toddler and newborn these days. I knew that if I chose a complicated design, it would never get done. Simple is key! Measure your table and find a piece of foam with the right dimensions to fit. I recommend using foam at least 4 inches thick. This will give you a nice cushy look without getting too pricy. My 24”x72” piece of foam was around the $30 range from Amazon. You may not find a piece that fits just right, and some cutting will be necessary in this case. I found it helpful to visualize my cuts first by making a paper diagram. In fact, I take the time to draw things out on paper before starting most projects. It’s a good habit to get into so I don’t start hacking away at my supplies and end up wasting money through trial and error. 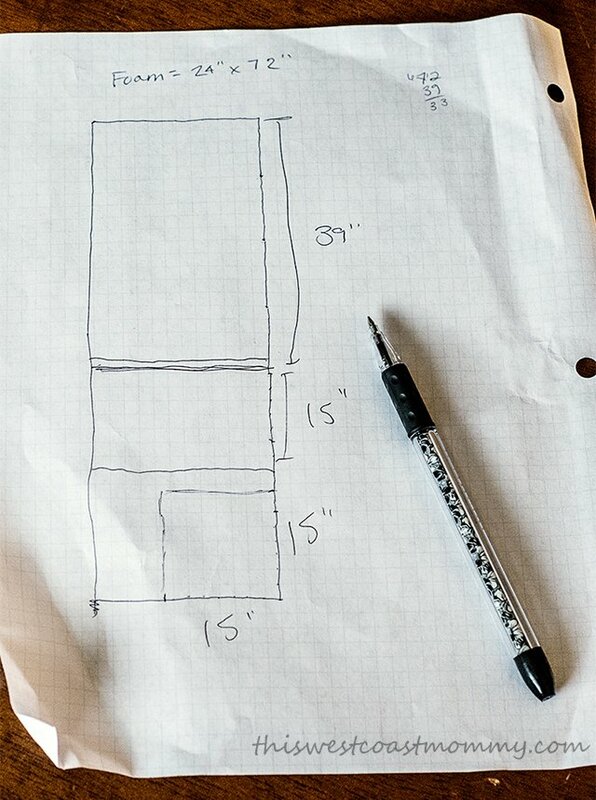 My table is 38”x38,” and I wanted the foam to hang over each end by 1/2.” Here’s a look at my diagram. 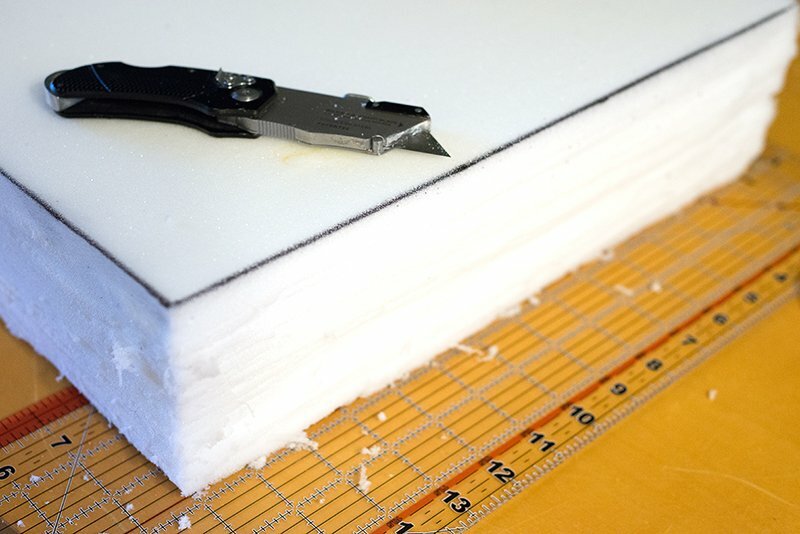 Once the foam arrived, I just followed the diagram and used a ruler and marker to indicate where the cuts should be. It seems a lot of YouTube people swear by using electric carving knives for this part. I don’t own one and didn’t feel like purchasing one, so I just used a utility knife with a new blade. I was expecting this step to be much more difficult, but with a sharp blade it slices through like butter. I highly recommend 3M Super 77 Multipurpose Adhesive for this part. 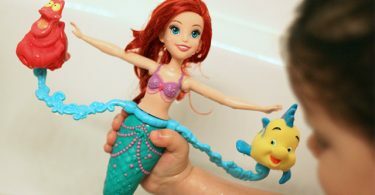 It works well on many surfaces and made the foam pieces really secure. After my foam was cut out, I glued it together piece by piece like a giant puzzle. Once the foam was glued into the dimensions I needed (39”x39” for those of you following along), I secured the whole thing to the top of the table. You may enjoy the added height of your new ottoman, but this was just too tall for me, so I opted to shorten the legs with a hack saw. Fortunately, my table legs had a really obvious place to make my cuts. If you end up shortening your legs, protect your floors by adding felt furniture pads to each new foot. The new dimensions of my ottoman top are 39”x39,” the foam adds an extra 4 inches of height on each side, and I wanted at least 2 inches of excess fabric on each side to tuck under the table top. That’s 39+4+4+2+2. That meant that my fabric needed to be at least 51”x51”. Upholstery fabric is typically 1 & 1/2 yards wide, or 54 inches. Perfect! I brought home this beautiful embroidered piece. Because of the texture and the diamond pattern, my ottoman design looks deceptively intricate. No complicated tufting needed. After centering the fabric over the top of the ottoman, I began securing it by putting just one staple in each side. Stretch the middle of each fabric edge down under the table top and staple. This holds everything in place while you work your way around, pulling the fabric down securely and adding staples every few inches. Leave 6 inches to either side of the corners. You’ll work on those after all four sides are done. There are multiple ways to upholster corners, but this is one of the most common and straightforward approaches. Again, simple is key! Just pull the corner tight, staple, and overlap the two loose wings of fabric. 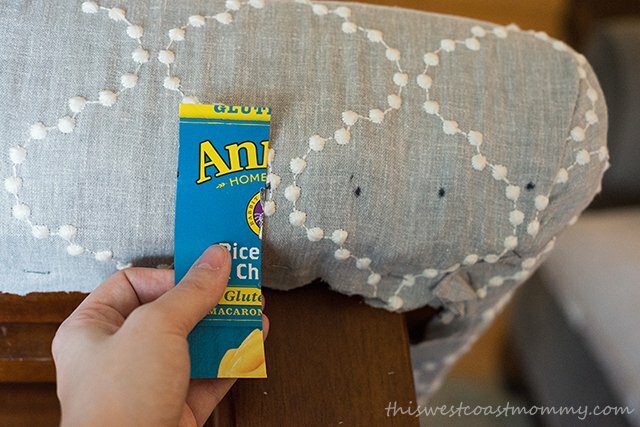 Add as many staples as you need to secure it underneath the table top. Step 8: The finishing touches! Yay! You’ve made it this far, and your ottoman is really starting to take shape! 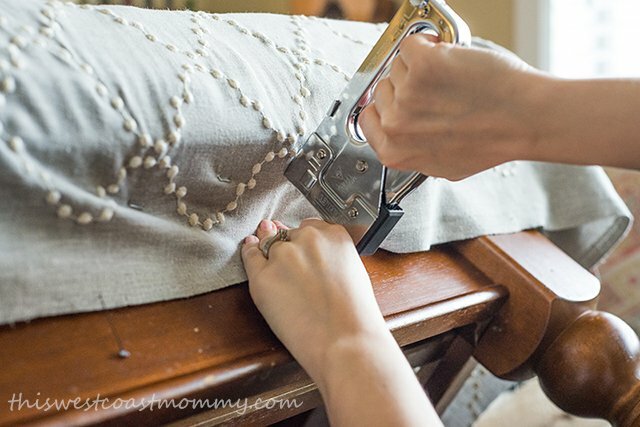 From here you can trim off the excess fabric and just enjoy your finished project as-is, or you can take it a step further by adding upholstery tacks like I did. I bought three boxes of 24 tacks each and calculated that I’d be able to place one approximately every 1.5 inches. To make the placement really easy and uniform, I made myself a little cardboard template 1.5 inches wide and made Sharpie marks to indicate where each tack should go. Once I had little dots all the way around, I took a regular hammer and gently tapped all my tacks into place. 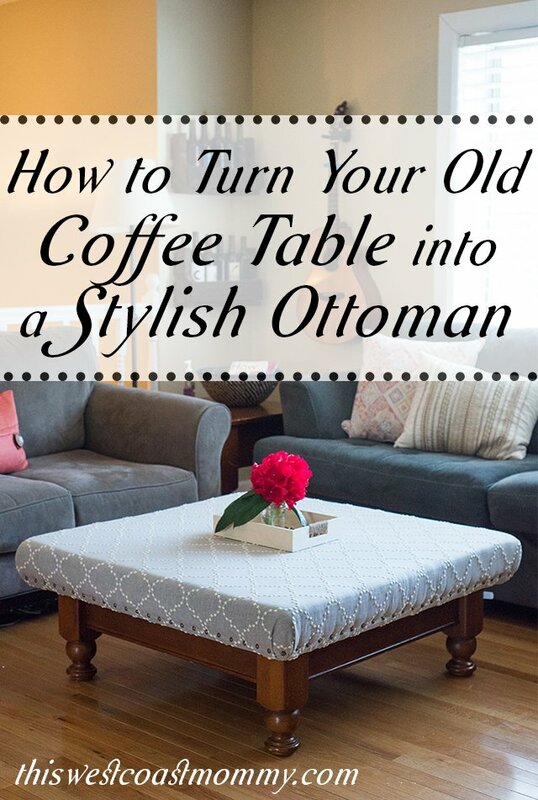 I like to think that if my old coffee table could talk, it would thank me for the makeover and tell me how much more exciting life is as a stylish ottoman. And I would thank it for its many years of service, letting babies learn how to pull themselves up and cruise around, allowing kids to drive toy cars all over its surface, and providing a comfy place for grownups to rest tired feet. 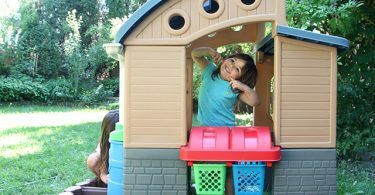 Little Tikes Go Green Playhouse: Eco-Friendly Backyard Fun! I love this. I dont have space for a coffee table. I never thought of telling legs to make shorter now I want a square and table to use. It would be perfect with my sectional. And nice to replace the old one in our family room. Awesome job!! 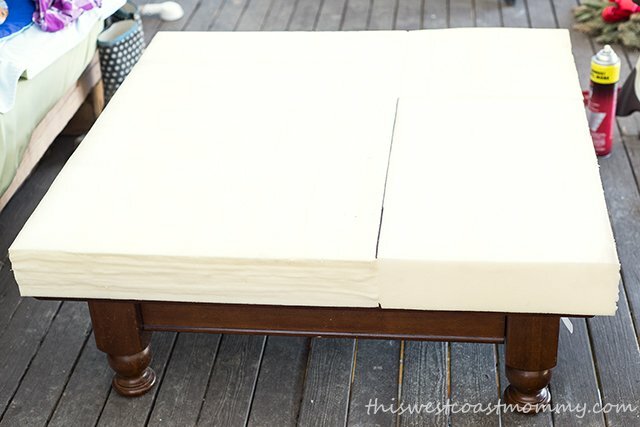 I love the finished look and you can’t even tell it was once a coffee table, what a great way to upcycle!! I love it,sure brightens up the room !! Oh wow, this is GREAT! 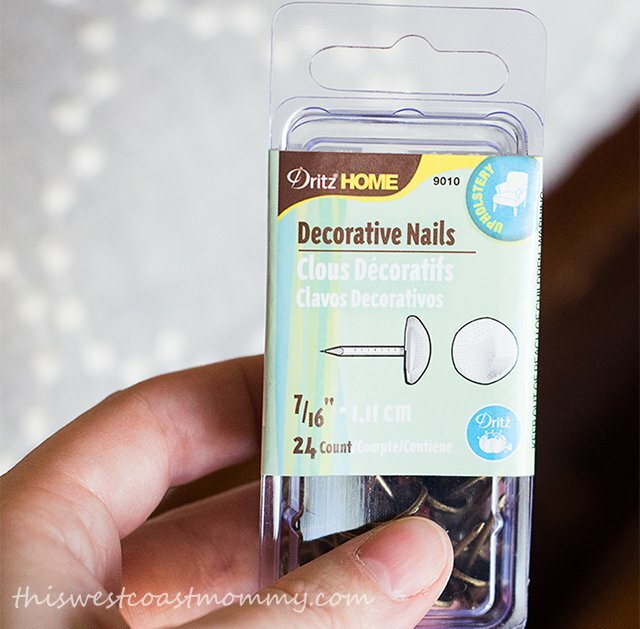 What a wonderful do it yourself activity! Awesome job!! I appreciate your hard working and expertise. I love the final (finished) look of the table. After seeing this no one can imagine that it was a coffee table before. Great idea, I have 2 coffee tables that we never use. This would be perfect for them, I can put one in the sewing room and one in the Grandkids Play room. Thanks so much for sharing. I love this what a great idea! Every time i come across this table ,i want redo mine ! Thank you for a wonderful idea. My old coffee table has taken a beating over the years with a few burns (from long ago days) and grandchildren doing crafts and playing. Perhaps my adult daughters can help me give the family room a bit of a lift while we share some quality time and fun together with this project. I only hope they see it the same way. Can’t wait to start. Wow! Really beautiful. What can I use to seal it from spills etc? I like this idea and would like to try it. Yours turned out beautiful! My main concern is what about spills? 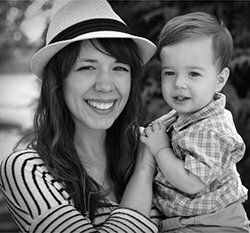 I also have a toddler and I don’t know if we will be able to keep it clean. Any thoughts or recommendations? I love the idea but I have an oblong table. Any tips on how to make in an ottoman?